In the wake of a violent night-time confrontation with Occupy Oakland demonstrators last week by the Oakland Police Department (OPD) and some 15 other law enforcement agencies, questions have arisen about the legality of the tactics used by the agency during mass arrests which led to serious injuries, including the fractured skull of a two-tour Iraq vet. Oakland’s Interim Police Chief Howard Jordan has maintained that the use of chemical agents and other so-called “less than lethal” weapons were required in order to defend law enforcement officials from demonstrators. Moreover, evidence in several of the videos suggests that the multi-agency task force may have violated both CA Penal Code Section 407 and an OPD Training Manual [PDF] that had been adopted pursuant to a federal consent decree signed by the Oakland PD after another confrontation with protestors some years ago. That federal consent decree was the product of litigation initiated after a brutal assault on a 2003 anti-war protest at the Port of Oakland, during which, according to civil rights attorney James B. Chanin, OPD not only deployed so-called “less than lethal firearms,” but ran over demonstrators with motorcycles, and shot and arrested longshoreman who were not even a part of the demonstration. Chanin reports that, during a deposition in the 2003 case, he “discovered” that the OPD had “infiltrated a subsequent demonstration, and even a planned route the demonstrators would take.” Video posted at the end of this article shows plain-clothed, under-cover cops mingling with demonstrators at Occupy Oakland, revealing that OPD used similar infiltration techniques during recent demonstrations as well. Audio included in the video captures Interim Chief Jordan bragging about the ease of infiltration. At that point we were in a position where we had to deploy gas in order to stop the crowd and people from pelting us with bottles and rocks, as I mentioned, some of the other chemical agents that were thrown at our officers…We felt that the deployment of gas was necessary to protect our officers and protect property around the area and to protect injuries to others as well. During his presser, Jordan discussed two separate actions in which gas was employed — a pre-dawn raid on the Occupy Oakland encampment and the action later in the evening at 14th & Broadway where demonstrators had gathered in protest. In fact, witnesses have explained to The BRAD BLOG that there were at least four different volleys of chemical agents at the evening protest. INTERIM CHIEF JORDAN: I don’t know that. We have to assess that. Martin denies her video, as seen above, was altered or edited to filter out protester provocation prior to the police action. A number of other witnesses we’ve interviewed corroborate her assessment. Her video appears to demonstrate that officials intended to use chemical agents before there was even a hint of provocation from the crowd gathered at 14th and Broadway. At the outset of her video, members of the SF Emergency Service Unit are seen standing behind a portable metal barricade facing demonstrators on the opposite side of the barricade. There are two rows of ESU deputies, the second of which can be seen holding what appear to be weapons used to fire 37 mm tear gas canisters. These weapons look very much like the ARWEN 37 (aka the “Anti Riot Weapon ENfield”), which its manufacturer describes as “the Father of all Less Lethal Systems.” The ARWEN 37 sports a “5-round rotary drum magazine.” Its range is said to be up to 100 meters. In the video posted below, the Canadian manufacturer of the ARWEN 37 states that officers are trained not to aim for the head, where the force of a tear gas canister could prove fatal. Note the comment from CST Mel Tourigny of the Ontario Provincial Police in that video [emphasis added] that “the ARWEN is used in situations where the police are dealing with individuals who are combative“, but compare that to the conduct of the crowd in Oakland, as depicted in the Abby Martin video. No “combative” protesters are seen in her video, even as police announce their intentions to the crowd to deploy chemical agents. We then see demonstrators marching up the street, holding signs and shouting: “Who’s street? Our street!” No sign of violence, rocks or bottles is apparent in the video. At approximately 2:35 into the video, we see deputies donning gas masks, as Martin narrates the action on scene, while also attempting to communicate with the SF ESU Deputies. As the first warning from officials is heard — “if you refuse to move, chemical agents will be deployed” — the camera pans the line of SF ESU deputies. They stand in the same formation as seen previously. They do not move. They do not flinch. There is no evidence from their actions that so much as a single object has been hurled in their direction. I am Sgt. Bates [sp? ], peace officer for the City of Oakland. I hereby declare this to be an unlawful assembly. And in the name of the People of the state of California, I command all those assembled at 14th & Broadway to immediately leave. If you do not do so, [unintelligible] by subsequent use of force if necessary [unintelligible] serious injury. Section 409 of the Penal Code prohibits remaining present at an unlawful assembly. If you refuse to move now, you will be arrested. If you refuse to move now, chemical agents will be used. Throughout the announcement, and as it is repeated, the Abby Martin video contains close up shots of the SF ESU deputies displaying no emotion; standing in the formation. No rocks or bottles can be seen in the air or on the ground. Neither is there audio evidence of glass breaking. After the announcement (appx. 4 minutes into the video), gas masks are seen on all front row law enforcement personnel. Still no rocks; no bottles seen in the video. At 4:40 into the video, as the camera has moved approximately 30 feet from the barricade, the police line is still visible. There is no evidence of rocks, bottles or any other objects in the air. The police line is still in place. At 4:53 into the video, we see former Marine and Iraq War vet, Scott Olsen, standing next to a sailor holding a Veterans for Peace flag and a copy of the U.S. Constitution. They’re standing perfectly still, within ten feet or so of the police barricade. At 5:09, the Abby Martin video depicts protesters, many holding hands, with their backs to the police, still chanting, “We are the people!” A police line is visible, but still, no rocks or bottles. At 5:14 into the video, after an edit point, the camera is further from the barricade. The crowd is still in place as we then see projectiles suddenly flying over their heads from the direction of the officers and into the crowd. The first explosions are heard. During his press conference, Interim Chief Jordan attributed the sound to the weapons used to fire the 37 mm tear gas canisters. This is followed by explosions of the canisters themselves and gas seen rising from the crowd which then begins to disperse amid the chemicals. Martin informed The BRAD BLOG that she had been within a few feet of the police and the barricade until it became clear that the police were about to gas the crowd. Her video, as seen above, confirms that account. As law enforcement officers began to deploy their weapons, she began backing farther away from the police barricade and to her left to get out of the line of fire. The camera was briefly off, then turned on again. As she backed away, Martin panned the crowd with her camera as projectiles from the police begin to fly. I can verify that protesters threw things at the cops AFTER they tear gassed and threw smoke grenades at the crowd. People did throw a couple of plastic bottles around me and a couple people picked up the smoke bombs [and] tried to throw them back at the barricade. A number of other witnesses present at the confrontation have confirmed that account to us as well. Footage aired on MSNBC’s The Last Word with Lawrence O’Donnell on the evening following the assault, corroborates Martin’s account of a demonstrator hurling an already smoking gas canister back towards the police line. But, again, no evidence is seen of demonstrators “pelting” the officials “with bottles and rocks” prior to their deployment of tear gas, as claimed by Interim Chief Jordan immediately following the incident. The final video posted at the end of this article includes several different camera angles from several different videographers. It begins with the former Marine Scott Olsen seen again in a camouflage jacket and hat, prior to his critical brain injury, standing next to the sailor holding the Veterans for Peace flag. The amplified warnings from law enforcement heard in Martin’s video are also heard in this video, as the crowd chants “we are the people!” in response. At approximately the 0:42 second mark, there is a good shot of the SF ESU deputies, gas masks now on, manning the same metal barricade. No rocks; no bottles; no reaction from the police to indicate they are being “pelted”. At 0:45 Olsen and the sailor are facing the SF ESU deputies, as tear gas smoke begins to rise from the street. Most of the other demonstrators are now further back. From the right side of the video; behind and to Olsen’s left, a streak of white gas hurling through the air towards the police line is seen, indicating that one of the demonstrators hurled a canister back at the police moments after the canister first began to disperse its content. That’s the first actual shot of any projectile moving towards the police line during all the video we’ve so far reviewed covering the moments before and just after the first use of chemical weapons on demonstrators during the evening confrontation. At the 1:11 mark there is a bright array of sparks, at the approximate location where Olsen was standing, but it is impossible to say if this is the moment when the former Marine was struck in the head. At approximately 1:35 of the video, we see, from a different angle, a group of demonstrators coming to the aid of Olsen. None of them are throwing anything at the officers. In fact, they’re all focused on Olsen when, at 1:41 to 1:42, an officer lobs an explosive canister, presumably tear gas, at Olsen’s would-be rescuers. It explodes in their midst, right next to the injured Olsen, forcing the responders to momentarily scatter. The officers appear to have ignored that warning from their own Training Manual. While O’Donnell did mention the word “before,” it is not entirely clear that Casini was precise in her response. What is clear is that Casini is the only protester we’ve been able to find who has given such an account to date. Her response is inconsistent with the video evidence available so far, as well as the account provided via email by Abby Martin. However, as other witnesses have reported, there were some four different volleys of gas used on the crowd throughout the evening. The BRAD BLOG has attempted to reach Casini in order to clarify her details, and to confirm that, in fact, she heard O’Donnell’s question clearly during the satellite interview. To date, we have not heard back from her, but will update this story if we do. Another account of bottles being thrown at police officials comes from James West of Mother Jones, who says he witnessed “two men throw bottles at the police”, even as the bulk of demonstrators were peaceful and chastised the “small, visible, determined group of agitators” who had hurled projectiles. Nonetheless, former Fox “News” host Glenn Beck saw no need to pin the matter down or to determine whether there was evidence that would conflict with Jordan’s so-far-unsupported “rock and bottle throwing” allegations. Instead, Beck seized upon Casini’s remark as seen on MSNBC, in an apparent effort to score political points against the demonstrators. Did OPD violate state law & training manual by declaring ‘unlawful assembly’? The mere fact that a crowd is noisy (this one was) does not mean that it is “boisterous” or “tumultuous.” A crowd can be declared an “unlawful assembly” only if the crowd is assembled “for the purpose of committing a criminal act” or there is a “clear and present danger of imminent violence,” according to the training manual. The police may not disperse a demonstration or crowd event before demonstrators have acted illegally or before the demonstrators pose a clear and present danger of imminent violence. One can understand why, in light of the stated legal requirements, Interim Chief Jordan would tell the media that gas was deployed only because his officers were being pelted “with bottles and rocks.” The video evidence, Abby Martin’s statements to The BRAD BLOG, and the eye-witness accounts of several others, however, directly contradict that claim. 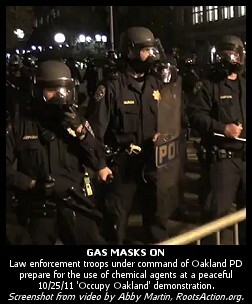 The only conduct indicative of imminent violence prior to the first use of chemicals by the Oakland PD’s task force, as seen in the videos published to date and as detailed by eye-witnesses, were the actions of law enforcement personnel donning gas masks and announcing their clear intention to deploy chemical agents. If the order to disperse was unlawful, then the ensuing use of gas was likewise unlawful as well. Thus, it comes as no surprise that, according to Lederman, the National Lawyers Guild is now contemplating further legal action against the City of Oakland. The Abby Martin video, and the others, suggest that no other crowd control method was employed at 14th and Broadway. A bevy of heavily armored officers, with helmets and shields, stayed behind a protective barricade as they fired “less-lethal” weapons and potentially lethal gas into a defenseless crowd of apparently peaceful demonstrators. As depicted by the last video posted below, there is a great deal of circumstantial evidence, including the nature of his injury, to suggest that Scott Olsen was struck by a tear gas projectile fired by an ARWEN-like weapon, as opposed to a hand-lobbed canister. There is no known definitive footage, however, at this time, pin-pointing the precise cause of his injury. Nonetheless, it is clear that if he was shot, it would have been at very close range, raising questions of an intent to inflict serious injury, especially given the explicit admonitions of both the manufacturer and the OPD Training Manual against aiming such a weapon at someone’s head. Although a number of bloggers have identified SF ESU’s Scott Bergstresser as the responsible deputy sheriff, one would hope that fellow supporters of Occupy Wall Street would recognize that the principle of “Equal Justice Under Law” includes the rights to both a presumption of innocence as well as due process. In that light, The BRAD BLOG takes exception to those who saw fit to publish Deputy Bergstresser’s home address on the Internet — an irresponsible action that could endanger not only Deputy Bergstresser but his family. UPDATE: This morning, the sailor who can be seen in the videos bravely holding the Veterans for Peace Flag and a copy of the U.S. Constitution immediately in front of the heavily armored contingent of SF ESU Deputy Sheriffs appeared on Democracy Now!. His name is Joshua Shephard. JOSHUA SHEPHERD: It was 7:30 in the evening or so. And it descended into chaos quickly. And I’ve never seen war, but that was as close to war, or a war zone, as I could imagine. AMY GOODMAN: What was taking place? JOSHUA SHEPHERD: Yes, just the tremendous use of force, the escalation of force, from Oakland PD and the assisting agencies. It was traumatic. Additionally, BRAD BLOG commenter Bill Larson furnished two excellent explanations of the legal issues that arise from our factual presentation in comment #3 & comment #5, below. UPDATE: The Port of Oakland issued a formal statement that “maritime operations are effectively shut down” in response to today’s General Strike, called in response to the violence at last week’s demonstration.